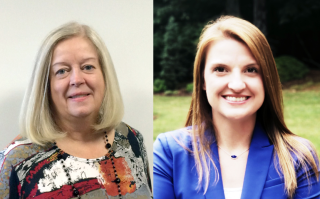 Blue Ridge Energy has announced that Tasha Rountree of West Jefferson has joined the cooperative as Ashe district manager, working in conjunction with current district manager Kay Sexton until her retirement in March 2019. Rountree has spent her entire career serving the residents and businesses of Ashe County. She joins the cooperative from First National Bank, where was assistant vice president and business development officer with responsibilities for developing and servicing small business relationships. Before that, she worked for Lifestore Bank as loan project manager and senior credit analyst as well as for Melissa Goodman, CPA as a staff account. She is a member of the Watauga Opportunities board, Ashe Rotary Club, Boone Business Exchange, and Ashe County Chamber of Commerce Business and Community committee. She is also a graduate of the Watauga Leadership Challenge. Rountree graduated from Appalachian State University in 2008 with a degree in Business Administration in Accounting. She resides in West Jefferson with her husband, Josh, and son, Henry. Sexton has served as Ashe district manager since 2010, with a total of 31 years with the cooperative. She began her career with Blue Ridge as a clerk/cashier in 1987 and was promoted to district customer accounts representative and assisted in managing the cooperative’s staff who provide telephone service to all members and customers. Due to her extensive and varied community involvement, she is a former recipient of The Touchstone Energy Commitment to Community award. Sexton remains heavily involved in the community and her activities include serving on the Ashe Chamber of Commerce board of directors and chairing the Business and Community Development Committee for the Chamber. She and her husband, Mark, live with their son, David, and daughter, Karina, in West Jefferson. She also has a daughter, Chelsea, and son-in-law, Matt Ledford, who live in Morganton. Sexton and Rountree work in partnership with Mike Kincaid, operations manager, to lead the Ashe district team of employees in serving Blue Ridge members and with Scott Jordan, Propane and Fuels district manager, to serve the customers of the cooperative’s propane and fuels subsidiary. Sexton and Rountree also have responsibilities for the Ashe district office showroom sales of propane home and hearth products such as gas logs and fireplaces, water heaters, backup power generators and outdoor living items including fire tables, grills and heaters.